What a little cutie pie! I put a little orange flower on her cause her shell was a little plain. Yeah!!! Free pattern!!! As Always!!!!! Ch 5, sc in 2nd chain from hook, sc in next ch, sl st in last 2 chains, fasten off. 5 sc in ring, sl st in first sc, chain 7, sl st in next sc, do this all the way around, sl st and fasten off. Stuff head, body, and feet. I sewed on the head right after the BLO decrease round, same with the tail. 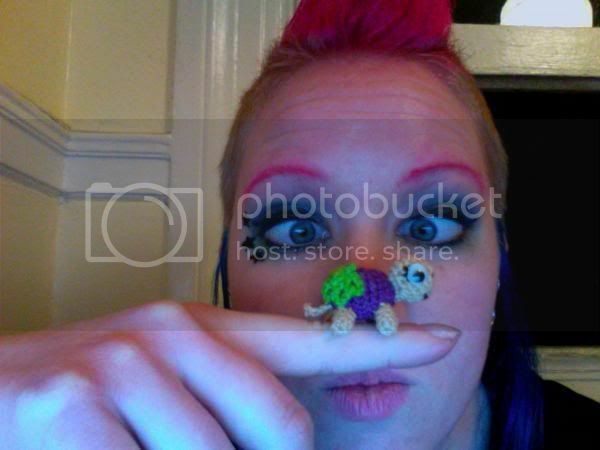 Sew on feet, glue on eyes, embroider mouth, enjoy turtle. Awwwwwww! I love it! Go Gnat! She is so sweet. Makes you just want to sqeeze her tight. 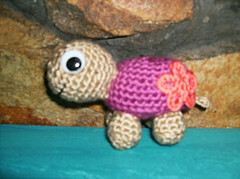 I’m going to make a little turtle as yours for my child. We loved it! SO CUTE! I’m starting to get into amigurumi and this little guy is just too cute not to make. I love the flower on his bum. Hi, it’s soooooooooooooo cute i love it!! I love it!! I making it for my daughter(6)for christmas! oh my gosh!!!!!!!!!!!!!!!!!!!! i love it!!!!!!!!!!!! thanx for sharing the pattern!!!!!!!!! Hi! 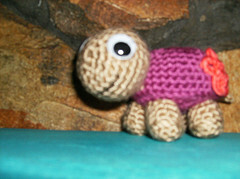 I has crocheted this small turtle already 3 times! Its simply as sweet as sugar! Sooooo cute! To Simone: That’s so cool!! Thank you!! that’s is so cute!! i just taught myself to crochet…and, i googled crochet stuffed animals…and, here i am!!! so…hi! i’ll be back to get the pattern, it’s adorable! thanks for sharing…even though i know this is in your archives, already!! Hello! thank you for your super nice comment!!! can’t wait to see it when you make it!!! how many do you chain to start the ring? I was just wondering, because you just say 6 sc in ring. I’m not sure what that means. THEY ARE SO CUTE!WE HAVE TONS OF THEM ALL OVER OUR ROOM. ME AND MY SISTER BRIT MAKE THEM EVERY DAY WITH MY MOM CARI! I’m attempting my first amigurumi project with this pattern!! I’ve finished the shell, head and one of the feet. I hope I’m doing it right. This turtle is so adorable! Gabie … the way I read this and I may be wrong but you just make a loop in the yarn and make 6 sc in that loop. And yes by the pattern it should come out bigger than a finger. This turtle is very cute as well as the pic of mini turtle on finger by Sabastion. I cant wait to try to make this. Hello. 🙂 I just wanted to post and say thank you for such a darling design. A gal on my cross-stitch message board answered my ‘plea for help’ in finding cute little stuffed animal patterns for my nieces…and yours popped up. Adorable! My wife is learning to crochet. We have a 3-month old daughter. This would be PERFECT. Thank you so much for the post. This is my first amigurumi I made. One of my friends baby theme was turtles & sheeps. I had a hard time finding a stuffed turtle. 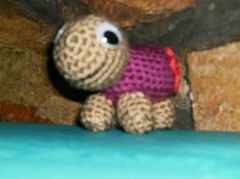 I decided to look for a crochet pattern for making a turtle and ran across your pattern. It took me a while to get it done (I’m still learning…). I made the shell pink for the baby and used black embroidery thread to make the eyes and the smile. It was so cute when I was done. Thanks for sharing your pattern!! Ahhh! Thank you so much for posting this. This is definitely an afternoon delight. This is my first amigurumi creation and I hope it turns out as good as yours! Thanks for the cute pattern! thank you 🙂 i dont have a penguin pattern…yet!! Wish directions (these directions and a few other sites) were more consistent through ALL sites. Cute pattern so I think I will make the actual pattern consistent and make these turtles amis :-). Oh duh. Now that I wrote that I realized it was the font! Oh geez, I’m sorry. I’ll be fourty someday but my eyes seem to be there already. And I am wearing glasses ;’\ I have to re-paste in a larger font, d’oh! its fine…im constantly squinting too!!! On the body, at row 10, your pattern says to use the back loop around. Do you use the back loops from rows 11-14,or do you use both loops for loops 11-14?